MK Gilad Erdan, who was next in line, was informed of his appointment environment minister. Erdan said in response, "I'm very excited. We'll lead a green revolution." He will also be a member of the Judges' Election Committee and serve as the liaison minister between the government and the Knesset. MK Limor Livnat will serve as science, culture and sport minister, and will also serve in the National Security Cabinet. Likud MK Reuven Rivlin was appointed Knesset speaker. Rivlin received a majority vote of 90 MKs, with no objections. Speaking at the Knesset after his appointment, Rivlin said, "The Knesset is not just a stage for ceremonies, but a panel for debating and decision making. We were not elected to act as stand -ins, but to take an active part, a central part in democracy." Later Monday evening, MK Gideon Sa'ar was named education minister, and will also sit in the National Security Cabinet. 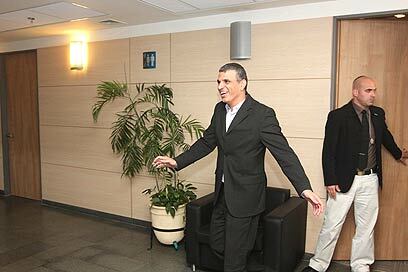 "Most of the meeting focused on the education system, the problems, and the need for a change in the system," Sa'ar said upon exiting Netanyahu's office. Netanyahu also informed MK Yisrael Katz of his decision to appoint him to the position of transportation minister. MK Yuval Steinitz is slated to be named finance minister, and former IDF chief Moshe Yaalon will be appointed minister of strategic affairs and will also serve as vice premier. MK Dan Meridor will be appointed to the post of minister in charge of secret services and deputy prime minister, and will also be a member of the National Security Cabinet and the Kitchen Cabinet. Benny Begin was named as minister without portfolio and as a member of the National Security Cabinet and the Kitchen Cabinet. The designated ministers were invited to meet with Netanyahu one after the other. Israel's 32nd government is expected to include 30 ministers and is slated to be one of the biggest government's in the State's history. Other positions still to be named are minister for development of the Negev and Galilee and the Knesset liaison. The ministers whose positions have already been secured are: Foreign Minister and Deputy Prime Minister Avigdor Lieberman, Defense Minister and Deputy Prime Minister Ehud Barak , Interior Minister and Deputy Prime Minister Eli Yishai, Justice Minister Ya'akov Ne'eman, Internal Security Minister Yitzhak Aharonovitch, National Infrastructure Minister Uzi Landau, Immigrant Absorption Minister Sofa Landver, Tourism Minister Stas Misezhnikov , Housing and Construction Minister Ariel Atias, Minister-without-portfolio Meshulam Nahari, Minister for Religious Affairs Yakov Margi, Science Minister Daniel Hershkowitz, Industry, Trade and Labor Minister Binyamin Ben-Eliezer, Minister for Social Affairs Isaac Herzog, Minister for Minority Affairs Avishay Braverman and Agriculture Minister Shalom Simhon. See all talkbacks "Netanyahu names Likud ministers "